It was a warm day and we were on an old road in a corner of what used to be a royal park. It is now university grounds but still has that swish of palaces, intrigue and celebrity at play. 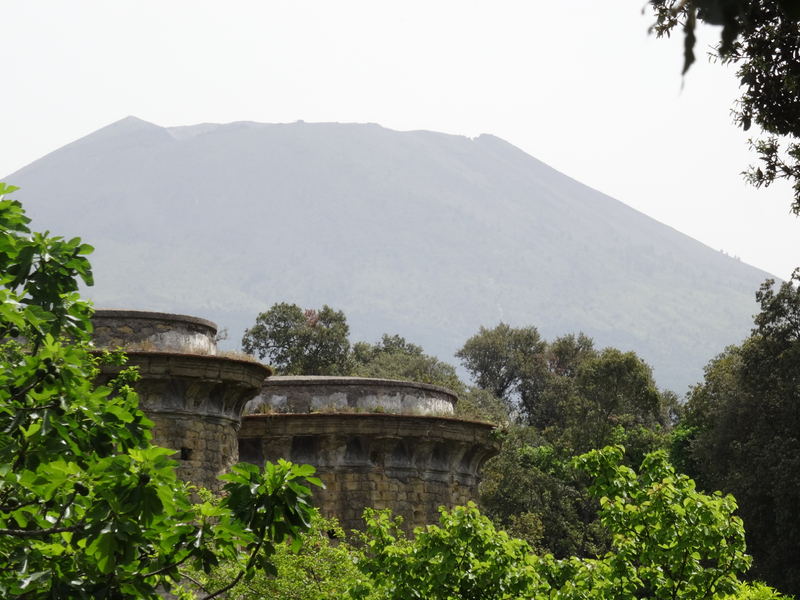 In front of us a smallish red building curved its face to catch views of Vesuvius and the sea. This, we were told, was where the king entertained his mistresses. Instantly the Italian guide had our attention. So private were these liaisons that the king (I’m still not clear which king) used the services of a dumbwaiter rather than staff. Apparently this king also loved armies and ‘war games’, so he had a military barracks built next to the small chapel on the far side of the moated courtyard. The complex, and the crumbling walls of the old moat, suddenly rippled into life. We could feel the stories coming alive. 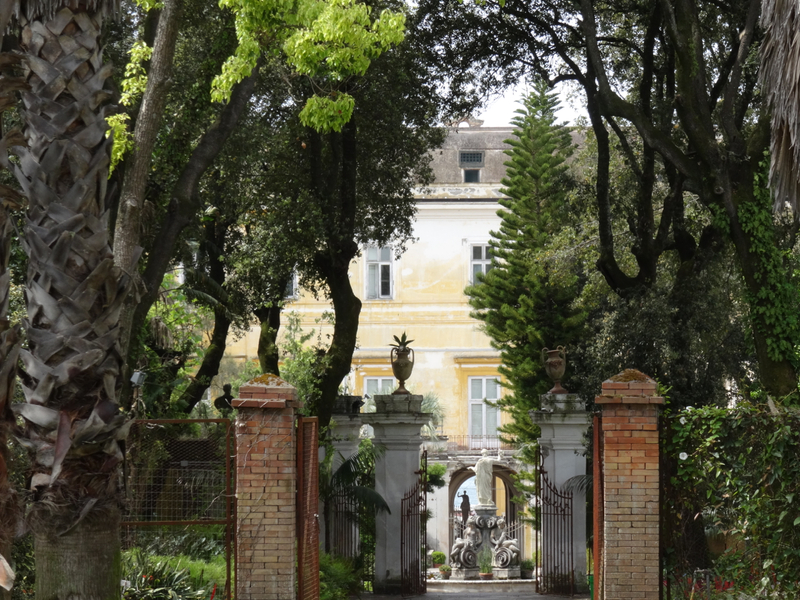 We imagined a little longer then moved on down a wide sweep of road through a wooded park towards the larger, sea-facing part of the university, formerly the Palazzo Reale di Portici. Today the grounds and palatial buildings are all part of the Facoltà di Agraria, of the Università Degli Studi di Napoli “Frederico II”. It is a place for botany and students – perhaps fitting for a site chosen by a young man almost three hundred years ago, towards the end of the 1730s, as the perfect place to build a royal residence. The man who commissioned the great, golden building was Carlos de Bourbon, son of King Philip V of Spain and his second wife, the Italian, Elisabetta Farnese – a woman of ambition and vision. This Carlos, Elisabetta’s eldest son sailed from Spain in his late teens. It turned out to be much more than a ‘gap year’. Carlos (Charles) started out as the Duke of Parma and by the time he was 19, thanks to diplomatic and military manoeuvrings, had become the King of Naples. 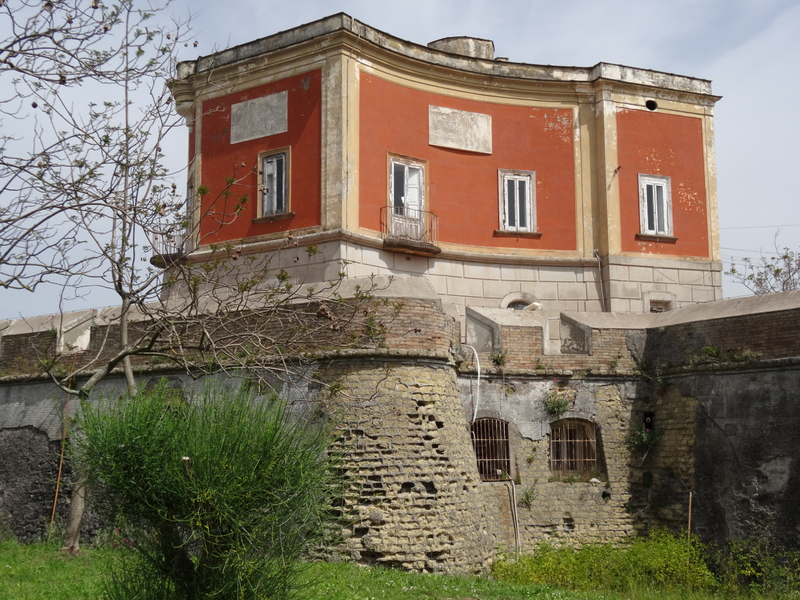 Three years later, when he was just 22, plans were in hand to begin work on a royal palace at Portici. When it came to royal palaces this young King of Naples had spectacular ancestry – his great-grandfather was Louis XIV of France, the ‘Sun King’, the famed personality behind the palace and gardens of Versailles. Charles had been shown how to aim high, how to emphasise his leadership with grand buildings, and Portici, close to the buried treasures of Herculaneum, gave him the chance to make an impression. Here he made full use of two vistas that not even Versailles could match – Vesuvius to the rear, and the Bay of Naples and the island of Capri to the front. Charles commissioned other palaces and grand buildings including the better known Capodimonte and the huge palace at Caserta. 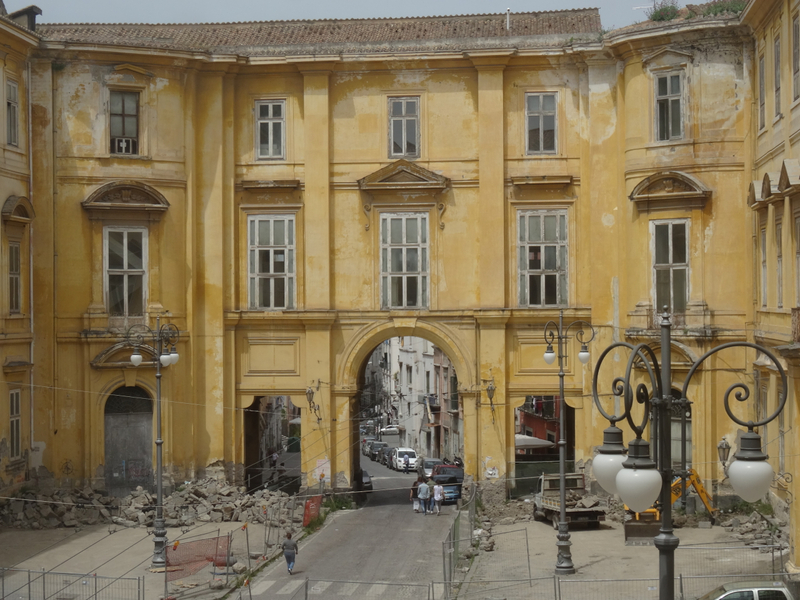 He also built the famous San Carlo opera house, down near the heart of Naples. We followed our guide down the road which runs through the wood to a junction where a grey wall towers out of the trees. This, we were told, was the equivalent of the King’s ball park. 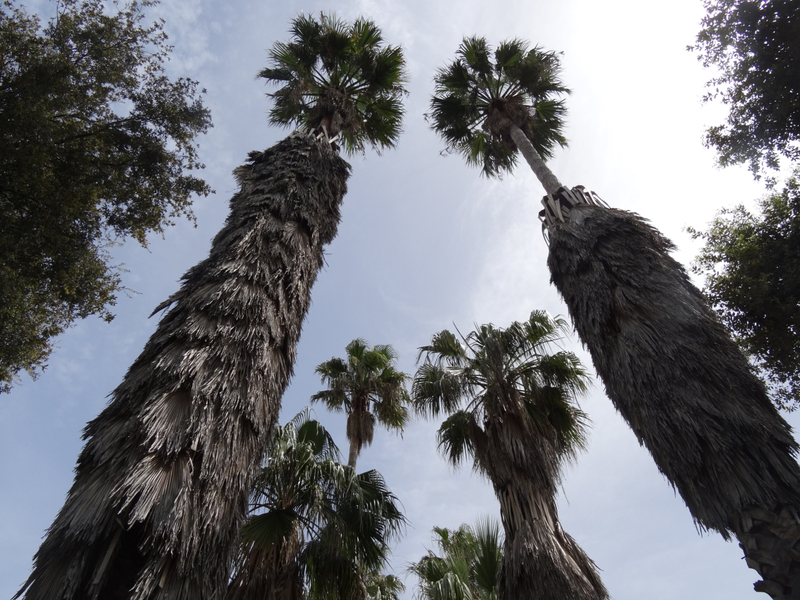 We stared up, and up again, in amazement. A gateway through the centre of this ‘games’ wall leads directly down through an avenue of trees to one set of entrance gates to the palace itself. 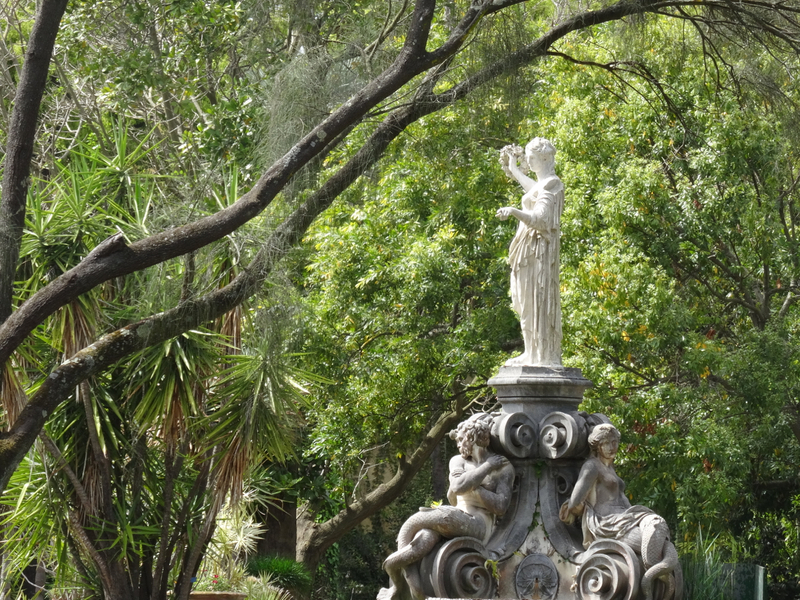 Today, even with the modern glass houses and the botanical gardens of the university to either side of the approach, there is a softness to the palace which is overseen by the battered statue of Flora. 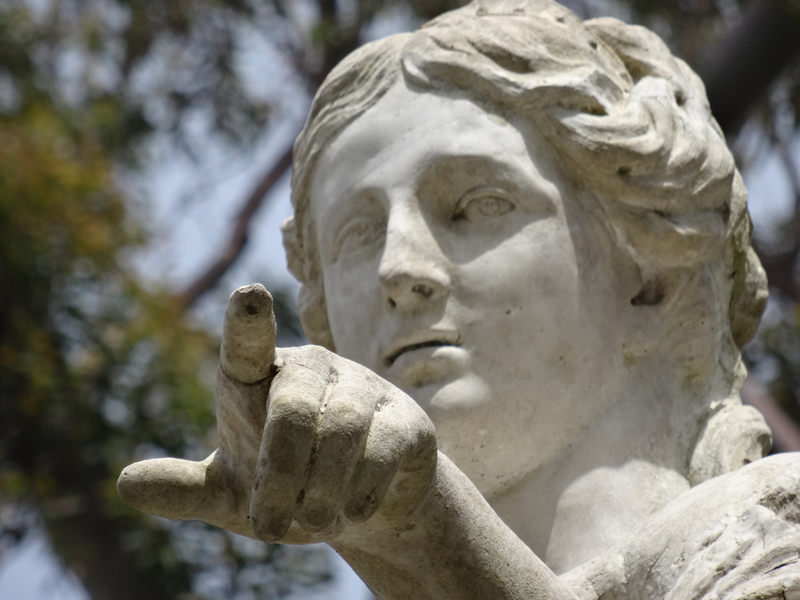 She was rescued from Herculaneum and, still elegant, faces towards the palace with a fountain at her feet, and with her back turned on Vesuvius, the volcano that buried her in AD 79. Inside the palace is empty of all its old furnishings. Instead there are tractors in the ground floor entrances, agricultural displays in the corridors, and students criss-crossing the courtyards. This palace, once the start of so much, now feels apart – not forgotten, but like an elderly matron trying to find her place in a new school yard. Perhaps King Charles would have been pleased. He wanted the palace to be part of the life of the local people and insisted that the public road, then called the Strada delle Calabrie, should run through the quadrangle at its centre. 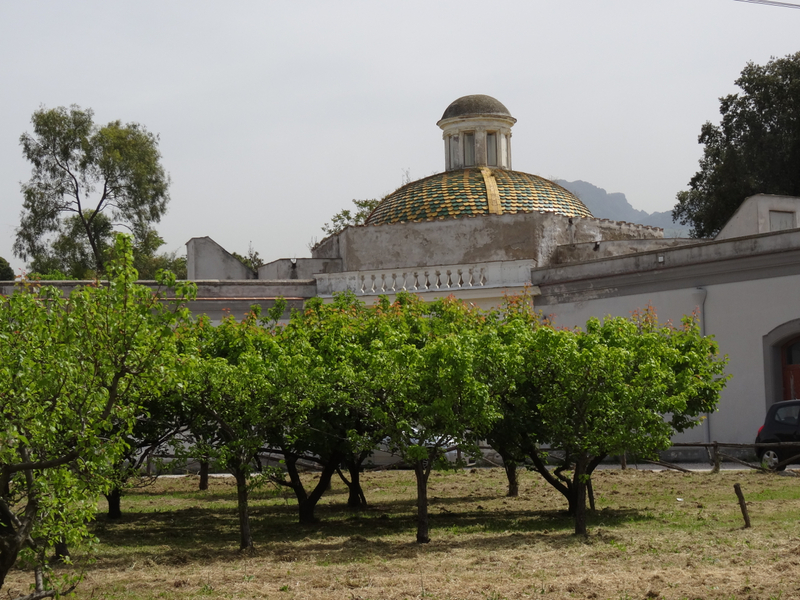 We wandered the high corridors of the palace, and gazed up at the painted ceilings and around at the sudden detail on the walls, and at the occasional agricultural displays. 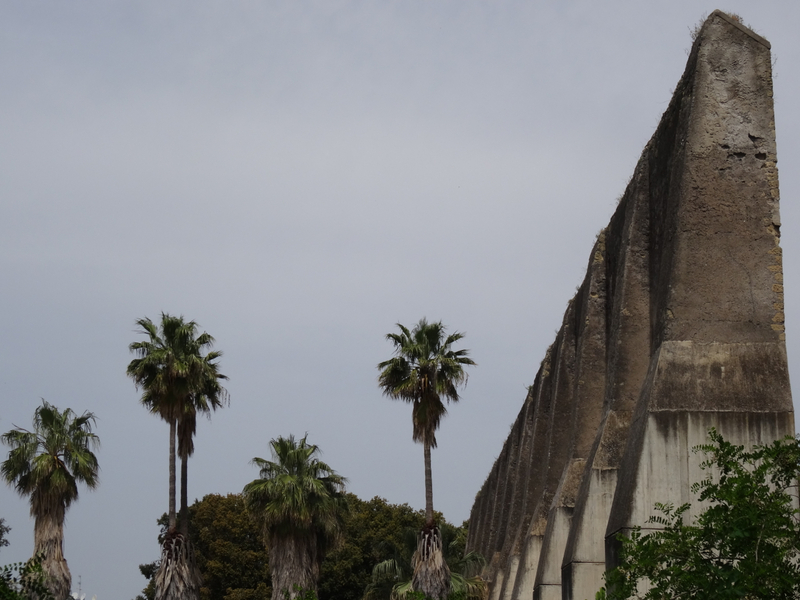 Windows designed for giants opened out towards the sea while lower down, and to either side, wide wings lined with statues sheltered a level below, stables perhaps in the old days – now overgrown carparks. It all felt light, simple, and forgotten – the entrance to another abandoned life. We left the palace along the public road that runs through its main quadrangle. To one side, through closed gates, we got a glimpse of the old Museo Erculaneo, former home to the treasures excavated at Herculaneum in the 18th century. Many of these treasures, stored and detailed by the Bourbons, have left Naples with a unique inheritance – much of it better known internationally than even the city’s grand palazzi. 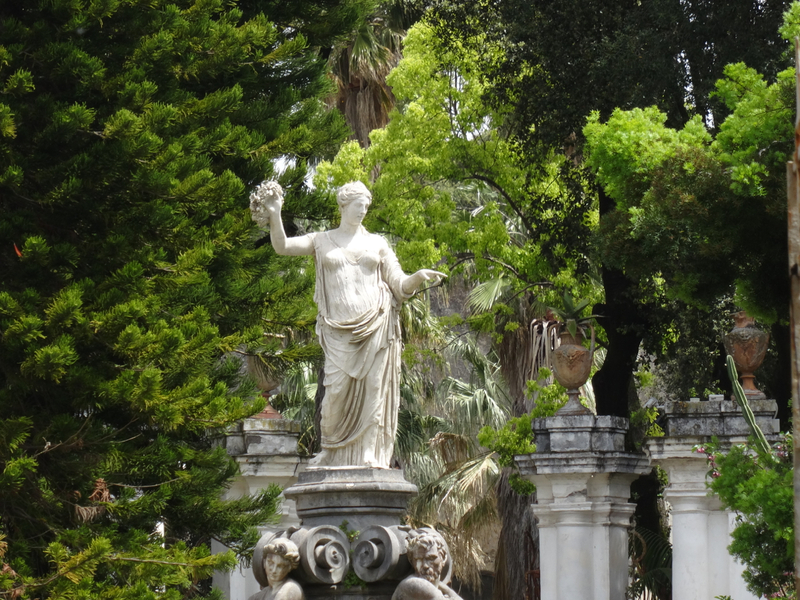 We ended our day with one last glance at Flora as we walked back through the university grounds, through the park of the forgotten palazzo reale, a palace that has helped to preserve so much that makes Napoli famous today. 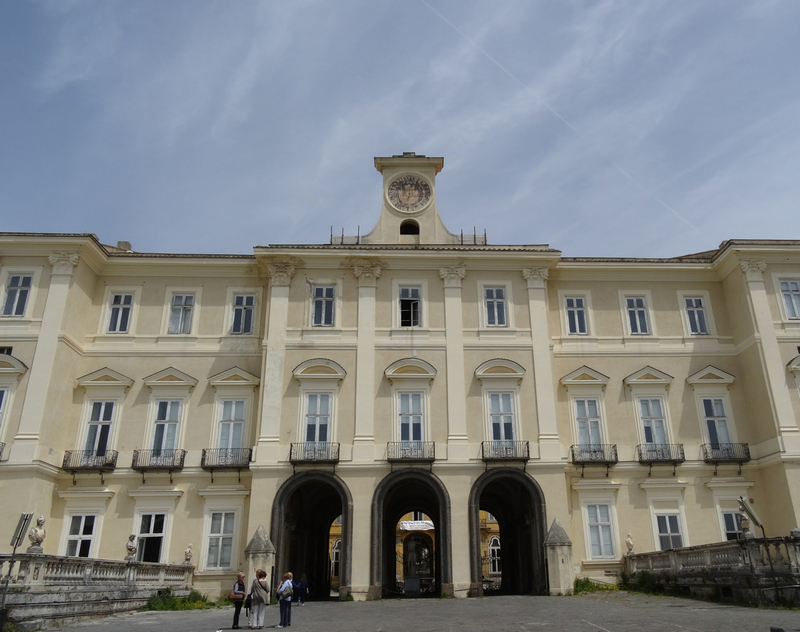 This entry was posted in Italy, Naples, Places to see in Naples and tagged Capodimonte, Capri, Caserta, Flora, Herculaneum, il palazzo reale di Portici, King of Naples, Louis XIV of France, Portici, the Bay of Naples, the Sun King, Versailles, Vesuvius. Bookmark the permalink. Love all your explorations … lucky you! So lucky! Thank you … wish you could join me. Thanks Lyn – it is so interesting and the location incredible.